Dr. Eileen de Jager was born in Somerset West, South Africa and moved to Moose Jaw, Saskatchewan at the age of nine, where she completed high school. During this time, Eileen also studied and performed music, particularly piano and violin. Eileen attended the University of Saskatchewan where she completed a Bachelor of Science in Physiology and Pharmacology degree (2014) followed by a Doctorate in Dental Medicine (DMD) in 2018. 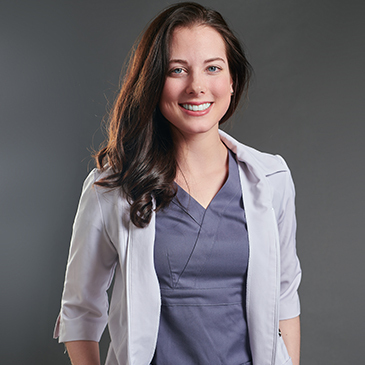 Eileen is a member of the College of Dental Surgeons of Saskatchewan (CDSS), the Canadian Dental Association (CDA) and the American Academy of General Dentistry (AGD). She enjoys spending time outdoors with her two dogs, Gunnar and Moose, as well as gardening.